Life with Lucy, David and Vivian: Hairbow! Lucy is turning into such a little lady and I love it! Every morning when she wakes up she will say, "Hairbow". I then have to put a hairbow in her hair. This particular morning, she already had one, but insisted on having another one that she needed to put in herself. 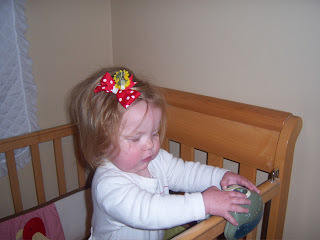 It was so cute how she put her hairbow in that I just had to take a picture of it! Other girly things she likes are feeding her baby and to put things in her purse. Oh, and a sure way to make her happy is to inform her that we're going shopping to which she will reply, "Yeeeeeahhh!" and clap her hands vigorously. a girly girl like claire! i love it! how fun that you'll have one of each! it'll be so fun to see their innate differences. The older they get the worse it gets! From planning their outfits days in advance to having specific intructions for their hair! Love it!! !